The remarkable men of the 449th Bomb Group Reunion. Nearly all of the men pictured flew between 42 and 51 bombing missions during the war, several of them surviving crashes, and a few becoming POWs on the Eastern front. Brave men indeed. In October, San Antonio was invaded by the extraordinary Flyboys and family members of the 449th Bomb Group Association, the Flying Horsemen. And what a terrific invasion it was! By the very kind invitation of the association, Faith and I spent 3 memorable evenings with them, getting a first-hand, crash course history lesson on the Flying Horsemen. Between January 8, 1944 and April 26, 1945, the 449th Bomb Group flew over 250 combat missions out of their base in Italy. Their losses were great as their targets were often the most heavily defended ones in Europe. "From the time they arrived in Grottaglie until they departed at the end of the war, the 449th lost a total of 135 aircraft. Of those, 111 were lost in combat and 24 were non-combat related losses." (449th Bomb Group Association). But their indomitable spirit persisted, making them "one of the most distinguished and decorated combat units of World War II." But this indomitable spirit went further than combat missions. Several of the veterans in attendance were ex-POWs. One in particular, a native Texan, Harvey Gann, was captured on January 30, 1944 and sent to Stalag Luft 4 near Grosstychow, Prussia. During his 15 months imprisonment, he attempted escape three times and finally on the fourth attempt, he was successful. However, by the time he arrived safely behind Russian lines, the war was within days of ending. "And to think I could have just waited," he laughingly told me. Each night there was something special planned for the reunion. The first night was a fun, "Get Acquainted Party." Folks dressed up in the smart styles of the WWII era, there was group singing and a special anniversary cake for Mr. & Mrs. Harvey Gann, who were celebrating 71 years that day. A little snippet from Squadron Night at the 449th Bomb Group Reunion last evening. Lt. Ed West (B-24 Navigator) & Faith sing, "I left my heart at the Stage Door Canteen." The next evening was Squadron Night, a personal favorite for me. This evening was all about celebrating the four squadrons of the 449th Bomb Group: 716th Squadron, 717th Squadron, 718th Squadron, and 719th Squadron. The veterans and family members sat at tables which represented their Squadron, and just like Texans, whenever an opportunity came up to applaud or cheer on the squadron, it was duly taken. During the evening, there was a terrific panel where each veteran was given an opportunity to share some anecdotes from the war or (in one delightful instance) sing a few wartime songs. This was followed by a fascinating lecture on the Willow Run Factory, a B-24 Bomber manufacturer owned by Ford Motor Company and based out of Michigan during the war. At the peak of her operations in WWII, Willow Run was producing 1 B-24 Liberator per hour! I can honestly say I never thought I would be so interested in a factory, but the history of Willow Run and her current restoration projects blew my mind. Saturday night, the final banquet was held at the Tower of the Americas, a memorable location to close out the reunion. As an outsider and onlooker, I have to say how much I loved seeing the enthusiasm and personal pride that was had for each Squadron and the 449th Bomb Group. This wasn't just an annual social get-together. It was a genuine and concerted effort to honor the men of the 449th BG and educate the younger generations on their sacrifices in WWII. Everyone I talked with at the reunion was so knowledgable about the 449th and spoke with such ardor about their relatives that I kept walking away from these conversations greatly moved and motivated to learn more. The amount of planning and coordination that went into the entire reunion was outstanding. I really must thank the organizers, specifically Denise Reigal, for including us in this special, special reunion. It was such an honor to meet your veterans, listen to their narratives, and even share a few songs with them. Though the weekend was short, our hearts were quite captured by the Flyboys and family of the 449th Bomb Group. Related Reading: Remembering a Statistic: The Crew of the B-24, "The Lady in the Dark"
Remembering a Statistic: The Crew of the B-24, "The Lady in the Dark"
Remembering that tonight, 73 years ago, the B-24 Bomber "The Lady in the Dark," was hit by flak, causing her to crash during a bombing mission over the Brenner Pass in Italy. With one exception, (Frank Visciglia, killed while attempting to bail), all crew members survived the crash. 3 were taken prisoner by the Germans, and the rest arrived safely behind American lines. A few months ago we had the honor and pleasure of meeting one of the survivors of this crash, Radio Operator, Bud Rosch, at the annual 449th Bomb Group Reunion. His fabulous personality captivated us, and his singing stole our hearts. When I realized that tonight, December 28, was the anniversary of his plane's crash, out of curiosity I started reading the after-action reports written by his crew members (https://449th.com/willding-crew/). It was remarkable. The 449th Bomb Group lost an awful lot of bombers in Italy during the war. There are plenty of statistics which will tell you that. But there is something about reading the reports and then putting a face to it which immediately takes a statistic and makes it personal. I can't say if Bud Rosch always remembers December 28 as the day the, "The Lady in the Dark" went down. But I do know he will always remember his crew. Guys like Wilding, Tuttle, Stringham, and Visciglia, living, breathing men who he served with so bravely during the war. For us, it's certainly worth marking the day on the calendar. Not for the date's sake, but for the sake of guys like Frank Visciglia who became a statistic when he didn't make it back. Remember him, Bud Rosch, and the rest of the crew of "The Lady in the Dark," and at least to us, they will never become statistics. 19 and doing a man’s job. This is what Robert Bergen, Navy Corpsman on Iwo Jima, related to us last Friday as we chatted over a dinner honoring Iwo veterans. This is one of the many remarkable things we heard last weekend at the annual Iwo Jima Association Reunion in San Diego, California, commemorating and remembering the bloodiest battle in Marine Corps history. Last year I was able to go to the reunion in Washington, DC, but as the girls could not make it, we were all anxious to make this one together. 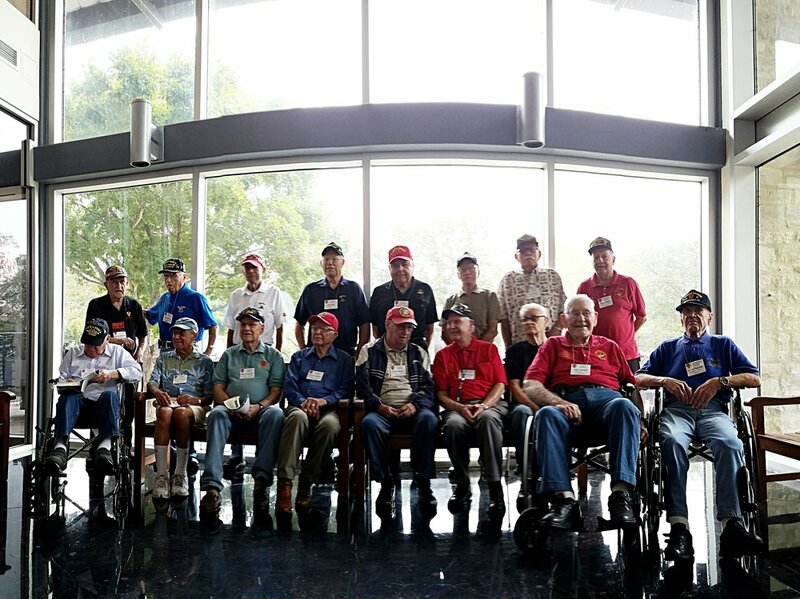 Especially as this year was to be a joint reunion of the East and West Coast veterans. So after saving up our pennies for several months, we finally arrived in Carlsbad, California, the headquarters for the Iwo Jima reunion. And what a week it was! Unforgettable. Amazing. Excellent company and conversation. There is too much to relate in one blogpost, so here are some highlights. George Vouros, gunner on the destroyer USS Izard (DD-589), told me that shortly after Pearl Harbor was bombed he went down to the Marine Corps recruitment office with his best friend to enlist. The recruitment officer took one look at him (height 5'3"), and then at his best friend (close to 6 feet), and said, “Sorry. You’re too short. You have to at least be 5' 4.” Disappointed, but nonetheless still determined to serve his country, Mr. Vouros joined the Navy. Fast forward a couple years and his ship was just off of Iwo Jima, parallel to Mt. Suribachi. There they put up a fierce defense for the Marines on the island, very narrowly missing a few shells fired from the Japanese on Iwo. Little did he know at the time that his best friend (the one he had tried to enlist in the Corps with), was fighting and would be eventually killed on the same piece of volcanic ash that the USS Izard was anchored off of. The tragic irony of life. This picture couldn’t help but evoke the lines "A bunch of the boys were whooping it up in the [Camp Pendleton] saloon; The kid that handles the music-box was hitting a jag-time tune," from Robert Service’s poem, “The Shooting of Dan McGrew.” No doubt the jag-time tune was something on the theme of "from the halls of Montezuma..."
Ivan Hammond, 5th JASCO, shares a behind the scenes story of the flagraising on Iwo Jima. Mr. Robert Bergen, Navy Corpsman on Iwo Jima. One of the really poignant moments during the event was a veterans’ panel one of the evenings. 10-12 Iwo vets recalled memories from the island, some hilarious, some serious. Mr. Bergen (mentioned above) related an incident with a patient that required immediate and intensive care. The man, a somewhat important figure, had been wearing a fur coat when he got all shot up. The fur from the coat became imbedded in his wounds, and when they opened him up, all they could see was fur and blood. It was impossible to distinguish anything. With little field experience, Bergen asked the head doctor, “What do I do?” “Irrigate!” The doctor said. Bergen had no idea how exactly to irrigate, so he took gallons and gallons of water and flushed it over the man’s body to clean the wounds. Then he patched him up and moved on. Years later he saw in the papers a notice about the ship the man with the fur coat had been on. Wondering if the man had survived, he wrote the paper to find out. Shortly after, he received a letter from the very man saying it was him, and thanking the “doctor” for saving his life. Bergen never had the heart to tell him he wasn’t a doctor, just a simple 19 year-old given a bunch of bandages, morphine, and told to “irrigate!" Not all of the weekend was so serious. There was quite a bit of hilarity that went around; and how can there not be when you have a gathering of nonagenarian Sailors and Marines from all walks of life and backgrounds -California surfer, Boston yankee, North Carolina southerner, Nebraska westerner, Greek, Indian, and all around American mutt, all who have had more life experience than pretty much anyone else. Throw in a few walkers, canes, portable oxygen tanks (“Anyone want a shot of oxygen?” - a comment we heard more than once), and it is a constant circus. We swapped old family recipes, discussed business, laughed at the disputes between Parris Island Marines vs the Camp Pendleton "Hollywood" Marines, and heard a few humorously odd stories from growing up in America during the great depression. It was a full weekend, both physically and emotionally, but ever so rewarding. Sometimes folks have asked why we don't do more film interviews. Honestly, because the relationships we are trying to cultivate with these dear men is more than just their oral history. No mistaking, we have done some film interviews, and we *always* write down their stories on paper. But in building a long-lasting friendship with them, we are laying in a store of memories for the future when there are no more WWII veterans. It's hard to imagine a time when these reunions will no longer happen. When we can no longer sit in a room full of Iwo Jima Marines, or Salerno T-Patch soldiers, or hear about the cold of Bastogne from a former tank commander or paratrooper. Our children will probably never know what it was like to know one of the "Greatest Generation," just as we will never know what it was like to chat over coffee with a veteran of "The Great War." And though it seems like they will be here forever, they are gone before you know it. Life is truly but a vapour, here one day and gone the next. Take every opportunity, not just with WW2 veterans, but with your grandparents, elderly friends, and all those beautiful old people that are so often overlooked. Spiffy dinner dates, and a fabulous time at the 36th Infantry Division "T-Patchers" Reunion this weekend... On the bus yesterday at Ft. Sam, our friend Mr. Dietrick pointed out the places he grew up, hunted rabbits, and took training. Other vets shared stories of meeting famous Generals in Africa, the Italian campaign, POW status, and lots more. So happy to have been with these great men. Below are some of the highlights we shared on Instagram. We're at Fort Sam Houston today with the 36th Infantry Division Reunion for commemoration of the Invasion of Salerno in 1944! Interesting note: The chapel the service was held in is the same chapel where Mr. Dietrick's brother's funeral service was held in 1940. His brother was accidentally killed when his gun misfired as he was coming off guard duty. That was 76 years ago. Just found this one from the 36th Infantry Division Reunion last week... Meet the Scarborough brothers. We mistook them for twins (as everyone else did) but they're actually 6 years apart! John, the younger (left), doesn't like this so much but he's a good sport. Both served in the 36th, one in WWII, the other during the Korea War. Together they make a pretty cute set of brothers who kept us in stitches of laughter the whole time. Exploring the museum at Fort Sam Houston. Mr. D. is explaining how the weapons worked. A fabulous dinner banquet celebrating and remembering the men of the 36th Infantry Division. The other week Jubilee and I popped up to Virginia Beach for the 5th Marine Division Reunion, one of our favorite weekends ever! For three days we were surrounded by the manliest set of Marines with truly harrowing stories of combat on Iwo Jima to tell. "See that Corsair (above), I was lying in the sand on red beach, D-Day [Iwo Jima]. I couldn't move forward, I couldn't move backwards. We were completely pinned down. I looked up, and there flying over me was a Corsair firing on the enemy. At that moment, it was the most beautiful thing I'd ever seen in my life." Two Marines discuss the differences in their bootcamp training. Another Marine said, "I wrote the battlefield reports for my Company: every casualty we had on Iwo Jima. I was one of only three other men in my Company of 145 men to come off the island without a scratch." "You don't lose many friends in the Motor Transport... but I lost a few." These words were said with great meaning. Two life-long friends and war buddies. "I was buried alive on the island, and this guy here (pointing to his friend standing by), dug me out and saved my life. That was right before he lost his leg." Quotes like this and many more are what we heard. Hard gritty stuff, humorous anecdotes, and tearful remembrances of comrades lost. It was a very special experience for Jube and me to be surrounded by such grand men and soldiers. Every man there had a story that would make any loyal American's heart soar with pride and gratitude.